If you have extra cucumbers this season, you don't need to let them go to waste. You can freeze them and use them later. This is a guide about freezing cucumbers. Cucumbers do not freeze well by traditional methods, but if sliced, preserved in vinegar or brine and frozen, they will retain their texture and make delicious additions to salads year round. 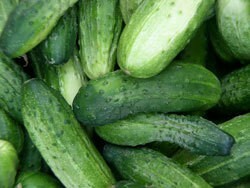 Select cucumbers that are firm and have a rich, deep green color. For freezing, they are best harvested when they are 4 to 6 inches in length and 1 to 1 1/2 inches in diameter. Organic cucumbers may not look as bright and shiny, but they are healthier because they are not coated with wax. Wash, remove wax and peel. Remove the wax from non-organic cucumbers with detergent and a brush. Slice cucumbers thinly with a food processor or knife. In a large bowl, mix 2 quarts of cucumbers with chopped onions and 2 tablespoons of salt. Let stand for 2 hours. Rinse well with cold water, drain and return to clean bowl. Add 2/3 cup of oil, 2/3 cup vinegar, 2/3 cup of sugar, and 1 teaspoon of celery seed. Mix well. Cover and refrigerate overnight. Pack cucumbers in brine in rigid plastic containers or glass jars, leaving 1 inch of head space. Freeze. Wait at least 1 week before defrosting and eating. Cucumbers preserved in brine will last several months in the freezer. Defrost cucumbers in brine in the refrigerator. If you have a zone in your refrigerator where the temp hovers around balmy 40ºF (like the inside door) fresh cucumbers will keep best when stored there. Store fresh cucumbers in perforated plastic, dry paper towels or a paper bag, or store them unwrapped in the vegetable crisper for 4 to 5 days. Cucumbers preserved in brine will keep for 2-3 weeks in the fridge. Question: Can I Freeze Cucumbers? I just thought I'd share that I made some tabouli and the recipe made a huge amount. I couldn't eat all of it so I thought I wonder how it would be if I froze it. Google a recipe for frozen pickles. I have made them and they are very good, like a sweet pickle. Question: Can I Freeze Fresh Cucumbers? Can you freeze fresh cucumbers? They turn soft and mushy when frozen. I think it is due to the high water content. But if you brine them like in a recipe for freezer pickles you can. Question: Can You Freeze Cucumbers to Pickle Later? 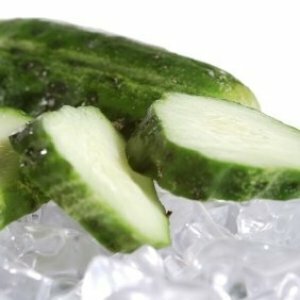 Can you freeze sliced cucumbers to pickle at a later date? Anything with moisture content is going to change structure when the cells freeze. When fall comes and we get the first freeze, that is enough to begin the mush process. That is why to put zucchini in the freezer for future use in baking, you must shred it and then expect more moisture to 'press out' to use in a recipe. All frozen veggies will react according to their water content. That is why it is best to bake with the product then freeze it instead of the ingredients. Can you freeze cucumbers from the garden? Sorry, but my experience is that they are super mushy when thawed. Why do you have to add sugar? Will this not make the cucumbers too sweet? Cucumbers have a high water content. To freeze them, they need to be brined. You can brine them with salt or sugar. You rinse it all off at the time of use. It really doesn't affect the flavor. You see better off making pickles out of them. I was just wondering why you have to add onions to the brine. Does this not change the taste of the cucumbers? It is my understanding that cucumbers do not freeze well. Did you mean to say pickling? Can I freeze cucumbers for a short period of time minus the brain? I would not recommend freezing cucumbers for any length of time because of their high water content. They will become mushy. After freezing the pickles, how long will they keep in the freezer? How do I thaw them out for eating? Thank you.